A Clean Eating Remake of this delicious Thai Recipe. 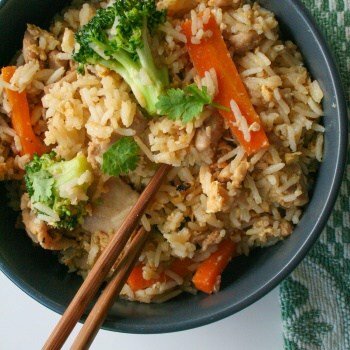 An authentic recipe for Thai fried rice – just like you get at Thai restaurants! A few years ago (before moving to our farm in the middle of nowhere) we lived within a 5 minute drive of a gorgeous authentic, Thai Restaurant. Their Thai Chef made the most amazing Chicken Fried Rice. Unfortunately, their recipe was so good that it has meant I’m always disappointed in my endeavors to recreate this dish. It has taken me so many failed attempts to recreate this recipe but I have finally done it! And it’s good for you! 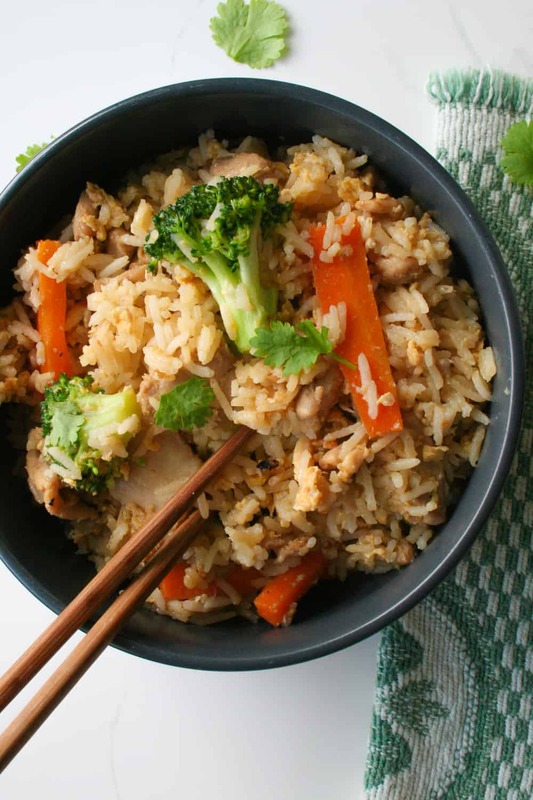 So dig in and enjoy this Clean Eating remake of Thai Chicken Fried Rice! Use a wok if you have one. The shape of the wok seems to heat up a lot hotter than my usual pots so you can cook fast and hot which browns the meat quickly and doesn’t overcook the vegetables. I let my rice cool before adding it to the wok. Leftover, refrigerated rice from the day before is perfect for this recipe. I used white basmati rice for the recipe but brown basmati rice works well too for a more wholegrain choice. Lemongrass can be found in the pickle section of the supermarket in jars. I think I need to grow my own because I could not find fresh lemongrass anywhere. When you add the eggs, push the chicken to the side or remove it from the wok and leave the egg mix to set a bit in the hot wok for a bit before stirring so you get pieces of egg rather than scrambled egg. It’s more like making an omelet than scrambled egg. Traditionally Thai food calls for Oyster sauce, but I couldn’t find one that I was happy with. So I recreated the flavor with a naturally fermented Tamari, fish sauce and brown sugar (just a little). Heat oil in a large wok or a large skillet over medium high heat. Add onion and stir fry for 1 minute. Add chicken and stir fry until it starts to brown. Add the garlic and lemongrass and fry for around 30 seconds. Add the vegetables and stir fry for 1 – 2 minutes. Push the chicken and veg to the side (or remove from wok) and pour the egg into the middle. Let it sit for a bit before breaking up. Don’t scramble if possible – you want eggy ribbons not scrambled egg. Remove from the wok. Add a little more oil to the wok and add the rice and sauce. Stir fry for 2 minutes so the rice is heated through. Stir chicken, veg and egg through the rice. Serve immediately, garnished with fresh coriander and lime wedges.